It is with great excitement that I invite you to the 11th annual Big Daddy Summer Spectacular. For eleven years we have had the pleasure of hosting this event and to showcase it in front of a crowd at Cheyenne Frontier Days. This year is even more exciting because Ken McNabb an internationally known horseman has graciously agreed to help us promote it to millions. Therefore the schedule will be slightly different than in years past. Wednesday, July 27, Ken will accept 20 youth for the first of many R.S.N.C Ranch sorting bible camps. This is an all-day event starting at 7:00 am and ending at 4:00 pm. Kids will learn horsemanship and ranch sorting skills while at the same time be able to share in Christian fellowship. Furthermore they will be able to watch the Air Force Thunderbirds Air show right at the arena. Wednesday evening at 6:00 pm will be a double A.Q.H.A sorting offering open, amateur, and youth divisions so bring you’re A.Q.H.A papers. On Thursday, July 28we will start the first half of the day from 8:00 am to 12:00 pm with an adult clinic by Ken McNabb and from there on through Sunday is 3 ½ days of spectacular ranch sorting competition. 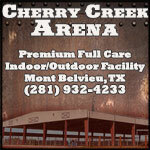 All entry fees are affordable for the whole family at $25 or less so come compete, have fun and win a Big Daddy Buckle! For more information and to register for the clinics please email: info@rsnc.us, call: 970-897-2901, or visit our website: www.ranchsorting.com. We look forward to seeing you there! What is Ranch Sorting National Championships (RSNC)? It is the mission of RSNC to lead the industry in developing and improving the sport of Ranch Sorting through affordability and a fair rating system. Our goal is to preserve the heritage and integrity of the ranching lifestyle while providing a family oriented, competitive riding experience at the grassroots level. RSNC was formally established in the spring of 2007 by horse enthusiasts who compete and participate in different equine events and who saw the potential for Ranch Sorting within the equine industry. What is the goal of RSNC? Our goal is to grow the sport to the largest equine sport in the nation. RSNC is helping contestants as a unified force to grow this sport, through exposure and national equine publications and media such as RFD-TV and Horse TV. We offer easy access to exciting competition for beginners, right up through the expert. 75% of all the competitors coming to RSNC events are new to horse sport competitions. It’s so easy anyone who can throw a leg over a horse can have FUN and compete. Ranch Sorting allows everyone in the family to COMPETE, WIN and get the recognition and rewards that in most equine sports only the very top competitors receive.